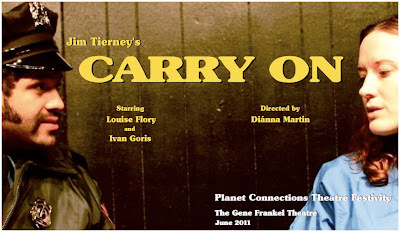 StageBuzz.com: Planet Connections Interview - Diánna Martin of "Carry On"
Planet Connections Interview - Diánna Martin of "Carry On"
I was around theatre all of my life, due to my family being in the entertainment business, my mother a Tony Award-winning actress, my father and acting teacher and director. I studied theatre both here and abroad, the former in acting, the latter giving me the opportunity to direct as well as act in at school in London. I was away from it for a few years while I worked in television and radio, and then about ten years ago I threw myself back into it completely. My emphasis is in theatre because it's so immediate and the choices huge; there is nothing to go back and edit, it's larger than life. The feeling of the audience's energy, being able to hear the audience breathe, gasp, laugh, cry, or be silently pensive as they take in the performance, or the applause at the end (assuming they applaud and don't throw tomatoes) is incredible. As a director, it is just as heightened, but you are watching from the audience or the wings, breath held as you observe the actors go forth and conquer. My parents, actress Ann Wedgeworth and director/teacher Ernie Martin. They paved the road for me to take steps to where I am now. My father was also instrumental in how I approach actors when I direct. In terms of directing, two favorites are Mike Nichols (after having seen his production of HurlyBurly on stage in the early '80s, I was mesmerized) and Sam Sheppard (who is fascinating to watch direct his work, such as A Lie of the Mind). Others would include Alexander Dinelaris (who has directed me) and Paul Alexander (a mastermind of minimalist staging, and yet another playwright who does a fantastic job directing his own work). Set in 1980 in NYC, this play has so many things going for it; it's a fascinating pair of character studies, and it's also a tale of how those two collide. On the one hand, this play is a love story. On the other, it's a commentary of how we as human beings continually, and without fail, have an uncanny knack of getting in our own way. I think the latter is especially true for people who live in New York City; those amongst the single people who are lonely, isolated, and caught in their own world, who find good things come along and inevitably they push them away. What inspired you to direct it? To begin with, it was written by Jim Tierney, who I think is one of the best playwrights working in New York City today. His characters are always rich and brilliantly damaged, a feast for any director or actor to get their hands on. He often sets them in situations that often have the same appeal as a car accident: you can't tear your eyes away, but sometimes you don't want to look to see what happens because it's so uncomfortable. Or, he puts them in "any man" situations, and due to their character quirks they turn the mundane into the sublime. He's brilliant. He has the knack of making you truly laugh out loud one second and go through angst for the characters the next. Having directed his work three times (including Banshee of Bainbridge at last year's Fringe Festival) I find the more I dig deeply into his work, I find so many layers to bring to the table with my actors and designers. Besides being a groupie of Jim's, I was thrilled to be asked on board to direct another play for Planet Connections this year. I was very fortunate to direct a play in the festival last year for MTWorks, Good Lonely People, by Carol Carpenter, and it was an incredible learning experience. Planet Connections is a great festival that brings a lot of gifted playwrights, actors, directors, and designers out to play. I've also worked with both of the actors, Louise Flory and Ivan Goris before, as a fellow actor and/or director; they are wonderful. Our Stage Manager, Jenna Lazar, is someone I've worked with several times, and who is one of the best out there. Our lighting and sound designers, Chris Weston and Darien Shulman are brilliant; in a festival setting with other people having access to your boards and space, you need to have professional designers who can help you through any situation. It's a great team. This piggy-backs onto what I started to go into above about Planet Connections Theatre Festivity. On the one hand you have a plethora of talent, but on the other you have this incredible opportunity to give back to the community and the planet - and do it while you're doing your art!!! I think the idea is wonderful, because if we can encourage people to make smarter choices about their use of our planet's resources while enjoying incredible theatre, then we're really doing all right. We have chose CEDARS, which is a organization benefiting children who have been the victims of abuse, neglect, or homelessness. Their services include foster care, outreach, and preventative programs that include life skills, counseling, and community intervention. They provide children with safe havens and communities with the knowledge to prevent the cycle of abuse and neglect to begin in the first place. Well, for starters it's a wonderful organization that really strives to make a difference for kids who really need help. In the play, Kate's son has an alcoholic absent father, but is fortunate enough to have a mother who loves him dearly. As a single mom, it's difficult to balance work and time with her child, but she does it. Thinking about all the children who don't have that parent who can make it work, and who fall through the cracks was an impetus for us to choose CEDARS. I am directing Jim's Mush in Fringe this summer, and then working on things for the IT Awards this Fall, since I have now become part of the Innovative Theatre Foundation staff. I also teach acting and I'm working with some fellow actors and directors regarding putting together readings and one-acts for the fall. If this play was a food...it just might be a really awesome cheese sandwich, perfect for getting caught in a thick 1980's moustache. You'll have to come see the play to figure out why.